Art By Yukari: What Do You Think? 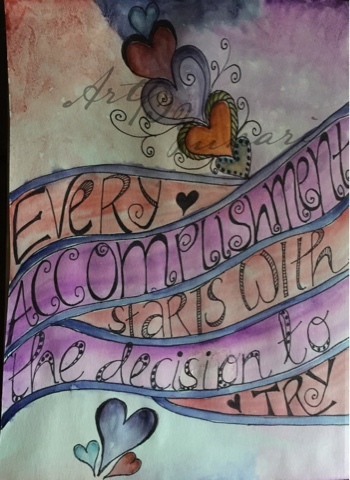 The quote above, with my art piece I created last September resonates with me now. My friend and fellow artist, Thorny Sterling, has been encouraging me to sell my art for months, probably close to a year. I had been thinking about it, so many friends and family encouraging me. But you don't move forward until you decide to try. Starting my blog was really my first step in this process. And it was another friend, Felicia, who actually got me to start my blog. It was her ever so gentle nudge that got me going. Last December, Thorny wrote about his process for setting up his art business in this post. And though I've done my own research, I've decided to go with many of his recommendations. I am using Big Cartel as my online storefront mainly because it's free to use if you have 5 or less items to sell. And Im using iPrintfromHome.com to print my art. I'm also going to check out Costco Photo Center as soon as its online ordering opens again. And by the end of the year, I will make sure to give you an update on how things are going. In the upcoming weeks, I would like to offer a weekly (maybe monthly) techniques challenge for people to try in their art journal and post their work on a common Facebook or a Google+ group. I'd like to learn to video my process and share on my blog. I have ideas. Hopefully, I can make some of them happen. And just in time, the kids start school in two weeks! This is the first year I won't have a child in elementary school. How crazy is that! So let me say, thank you! Thank you for your encouragement, your support, and for believing in me. This is FABULOUS!! :D I'm so happy you've taken the step into selling your art <3 Wishing you many happy sales! Thank you Helena! I'm really excited! Anna ❤️❤️❤️! I'm going to give it my best effort! This is absolutely wonderful, Kari! Well done! Thank you, Cody! I'm just so happy to be sharing my art! Your art is beautiful. I am so glad you've decided to put out there for other people to be able to have and enjoy it in their own homes or gift to others they know will appreciate the beauty in the art and the wisdom in the words you choose put with it.